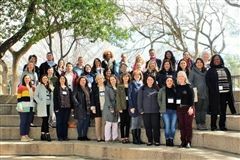 Thirty-five College Counseling Assistants from 15 states descended upon Fort Worth and Fort Worth Country Day in February for the annual Association of College Counselors in Independent Schools (ACCIS) Office Assistants Program. Terri Hutton, FWCD’s College Counseling Office Assistant organized the event, which took place February 19-21 and allowed 35 assistants to come together for a discussion of best practices. Founders' Day 2019 from Fort Worth Country Day on Vimeo.